Charging Admission For Horse Racing? Horse racing still charges for admission in the US? Living in Ontario can really shelter a Horseplayer I guess. I couldn't imagine paying admission to get into a racetrack anymore, and I'm pretty sure that if Ontario tracks started charging again, the stands would be completely barren, except for those working in the backstretch, who get in free. Las Vegas figured out a long time ago, charging gamblers to get in would not be a winning proposition. In fact, a portion of the revenues they make from people gambling is used to give bigger gamblers comps (casino jargon for rebates). Sure, they charge non gamblers a lot of dough to see shows, and I would have no problem if a track had a theatre inside that had comedians, singers, or magicians, and charged people for it, but they don't, they have horses that run around a racetrack (when I put it that way, it kind of sounds like roulette), and the track charges around 21 cents on average for every dollar bet at the track on these events. I don't see how this isn't incentive enough for track marketers to focus on (it would be even better for the track long term if they only charged 14 cents on average for each bet, but that is a slightly different and a much longer argument). If the idea of charging admission is to eliminate people from entering a racetrack that have no money or don't bet, if that really is an issue, the problem can be solved by charging admission but have the players use a betting card to get through the gates (if they don't have a betting card, most will likely get one). When the player bets $20 or $30 (or whatever amount the track wants to use), they immediately get the admission money credited back to their account. Getting more creative, charge admission, but give a betting voucher for that amount, maybe even a couple of dollars more than the admission, that can only be redeemed for an actual bet after the 6th or 7th race, which means that player has to stay to recoup admission (use track betting cards or picture ID so that these coupons don't get sold or given away in a black market scenario). How about charging admission, but give a free admission coupon that has to be redeemed within 2 weeks? Since I'm on a roll here. 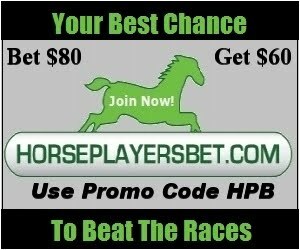 Tracks that don't charge admission (and tracks that do charge as well) should think about giving out $5 betting vouchers to Horseplayers who are still at the track for the 7th race or later that can only be used at a later date (anytime but today within 1 or 2 weeks). I think the days of getting people to getting used to going to the track every day, like the old days has gone the way of the rotary phone, still, the best way to make new Horseplayers is to at least get them to track and experience live racing. Getting the first timer back to the track is big if horse racing is to grow again. But it is also very important to keep the old customers happy. They are the bread and butter, and they are also the best marketing tool a track has right now, because they are the one's who are most likely to bring newbies to the track.